So lately, this has been what’s confronting me: Packing. And more importantly, sorting! In general the number of “give away” bags outnumber the “take it with you” boxes, which is good! I carted 4 trash bags full of clothing to the drop box nearest to my house on Saturday. I hope someone enjoys the handmade goodies in there. I actually like moving, because it makes me feel lighter to sort through all of the stuff that just accumulates. I mean, I love notecards, but I don’t need ten boxes of them. Other than that I’ve just been feeling a little restless (10 more days till Paul gets here! ), so I’m doing short term projects. 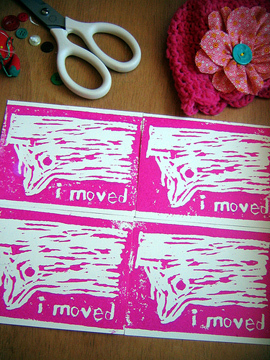 I made some change of address cards this week, and a little baby hat (in the right corner) for my friend. I also need to think of a project for the 4+ day drive, but I know if I start it now, I’ll finish it before I even load a box! I’m thinking of a baby blanket, but we’ll see. In the mean time, I’m trying to enjoy other things. Like sauteed pears. Yum. I have a recipie for chicken and pears (from Jane Doerfer’s Going Solo in the Kitchen) that I’ve never quite achieved perfection with, but it’s still fun to make. I just always forget that the chicken doesn’t take as long to cook as the pears. Maybe next time! a clean-out and fresh start is always good! 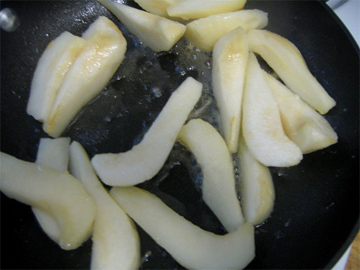 and sauteed pears....yum! 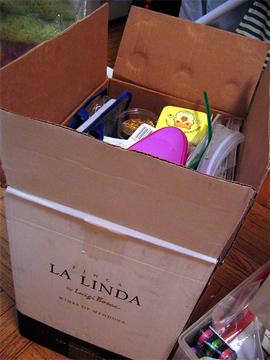 yeah, my problem is that i want it to be organized (ie "this box has only paper craft stuff, this box has only fabric") but that isn't as box-economical as shoving everything that will possibly fit in each box! i am sure i will end up in a last minute scramble too!